We are a professional die casting company in China, we have produced many die casting parts in AlZn10Si8Mg alloys, if you are looking for aluminum die casting parts in AlZn10Si8Mg alloys, we will be one of your best partners, we do not only produce die casting products in AlZn10Si8Mg alloys, but also may type of aluminum alloys, zinc, and magnesium die castings, contact us to get price. The thermal treatment of die casting products still represents the best option for the manufacture of die casting parts with high mechanical strength. However, the manufacture of alloy materials suitable for thermal treatment requires special casting measures. AlZn10Si8Mg alloys presented here offer designers specific advantages. In particular, the AlZn10Si8Mg alloys have a very high 0.2% yield strength. It has been widely used in aviation, aerospace, automotive, machinery manufacturing, marine and chemical industries. With the rapid development of the industrial economy, the demand for aluminum AlZn10Si8Mg alloy welded structural parts is increasing, and the research on the weldability of aluminum alloys is also deepened. AlZn10Si8Mg alloys have excellent corrosion resistance and are well suited for welding. The high shrinkage of AlZn10Si8Mg alloy in comparison with aluminium – silicone alloys must be taken into account when designing die cast molds. The requirements for the die casting parts, particularly in consideration of the intended use and the technical feasibility in the casting factory, determine which of the presented alloys should be selected. As a high pressure die casting manufacturer must focus not only on fulfilling the customer specifications but also the increased customer profits. This includes practical customer advising on site and active identification of customer’s need. 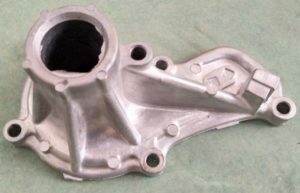 We will fully follow our customer requirement on the alloy material selection, or we will recommend a suitable aluminum alloy base on the customers specification, 100% satisfy our customer is our task, The die casting alloy products includes the primary aluminium die casting, zinc die casting, magnesium die casting, and sand casting, gravity die casting as well as a number of low pressure die casting. In the production of alloy vehicle components, industrial parts, The main alloy for use in die casting is AlZn10Si8Mg alloys. AlZn10Si8Mg alloys are self-hardening with these alloy types, the mechanical properties are achieved after storage of approximately 7 to 10 days at room temperature. The die casting alloy AlZn10Si8Mg achieves high values for tensile strength and offset yield stress, however, the low ductility limits the application range of the alloy. In one test series, reduction of the zinc content to Approximate 6 per cent by weight of the AlSi9Zn6Mg achieved a significant increase in the ductile yield. Below Table shows an overview of the achievable mechanical values between AlZn10Si8Mg & AlSi9Zn6Mg.